(Beyond Pesticides, January 31, 2019) On January 16, the Center for Food Safety (CFS) filed a new rulemaking petition demanding that USDA explicitly prohibit hydroponics from the organic label and revoke all existing organic certifications on hydroponic operations. CFS and more than a dozen co-signing organizations grounded their demands in the failure of hydroponic production to increase soil fertility, conserve biodiversity, and build soil organic matter, all legally required to achieve certification under the Organic Food Production Act (OFPA). Hydroponic plants are grown without soil and fed entirely through manufactured nutrient solutions. Hydroponic operations rely on nutrient inputs that do not return to the system. Whether or not these inputs are organic products, the hydroponic practices themselves, CFS notes, fulfill zero out of the three core requirements that define “organic production” in OFPA: to “foster cycling of resources, promote ecological balance, and conserve biodiversity.” The central principle of the legal argument is that soil is integral to organic production. Citing OFPA, to be called organic, producers must engage in practices that actively support the rich, living biodiversity of the soil that sustains future production. The prohibition of hydroponics from organic certification has been the position of organic regulators and the National Organic Standards Board (NOSB) for decades. A 1995 NOSB recommendation states, “Hydroponic production in soil-less media to be labeled organically produced shall be allowed if all provisions of the OFPA have been met.” However, when the NOSB proposed regulations for greenhouse standards in 2001, hydroponic production was rejected as not meeting all basic organic production principles. (See Got Organic? Grown in Nature in Soil or Factories in Water Solution?) 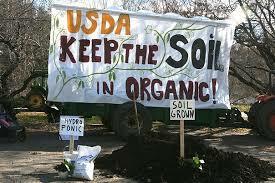 In its 2010 recommendation, the NOSB clearly affirmed the long-standing hydroponics prohibition and other soilless methods in organic production. In 2015, the Hydroponic Task Force (HTF), a committee of NOSB and agricultural experts formed by USDA, unearthed further evidence calling “organic” hydroponics to question. The reports of the Hydroponics Task Force (HTF) provide good evidence that hydroponics is not, and cannot be, organic. The task force “report” is actually two reports under one cover –two reports written by subcommittees with very different viewpoints– the 2010 NOSB Recommendation Subcommittee (2010 SC) and the Hydroponic and Aquaponic Subcommittee (HASC). The former represents the viewpoint that organic production must be in the soil, and the second promotes certification of “organic” hydroponics. Beyond Pesticides described in comments to the NOSB the clear consensus in the organic community. After more than a decade of inaction by regulatory agencies, the petition is elevating the urgency on the hydroponics ban. The U.S. is the only developed country still allowing hydroponics to fall under the organic label. Canada and Mexico prohibit hydroponics from organic, and the European Parliament voted to end the organic certification of hydroponic products in April 2018. With the U.S. regulatory gates open, industrial hydroponic operations have access to flood the organic market and, longtime organic producers warn, to push soil-based organic farmers out of business. “Hydroponic producers getting the benefit of the organic label without actually doing anything to benefit the soil undermines the standard and puts all soil-based organic farmers at an untenable economic disadvantage,” stated Kate Mendenhall of the Organic Farmers Association. The CFS petition represents the urgent demands of a growing number of organic farmers and consumers waking up to this invisible invasion and fighting to regain lost ground. Contribute to the movement to protect the organic label by staying abreast of new legal and regulatory developments through Beyond Pesticides’ Daily News Blog. And stay engaged with the organic rulemaking process through Beyond Pesticides’ Keeping Organic Strong webpage. This entry was posted on Thursday, January 31st, 2019 at 12:00 am	and is filed under Agriculture, Alternatives/Organics, Hydroponics, National Organic Standards Board/National Organic Program, Uncategorized, US Department of Agriculture (USDA). You can follow any responses to this entry through the RSS 2.0 feed. You can skip to the end and leave a response. Pinging is currently not allowed.